You are at the home page for PAS Intervention, a 501c3 nonprofit for dealing with Parental Alienation/Custodial Interference/Hostile Aggressive Parenting. No matter what you call it, it is a form of psychological abuse when a parent is alienated from their children. At PAS Intervention, we are dedicated to Ending Child Abuse and Parental Alienation through educational awareness, research/development, free online support groups, legislation, legal and any other venue available to us. Please feel free to also contact us at info@pas-intervention.org We are always there for you. * Scroll down for more information. So my question: How many parents have ex spouses who are alienators that are self-representing i.e. pro-se vs. how many alienators have attorneys? In Compliance with ADA, if you are disabled with visual or auditory issues, please let us know how we can make our site more user-friendly for you. Thanks! URGENT!! 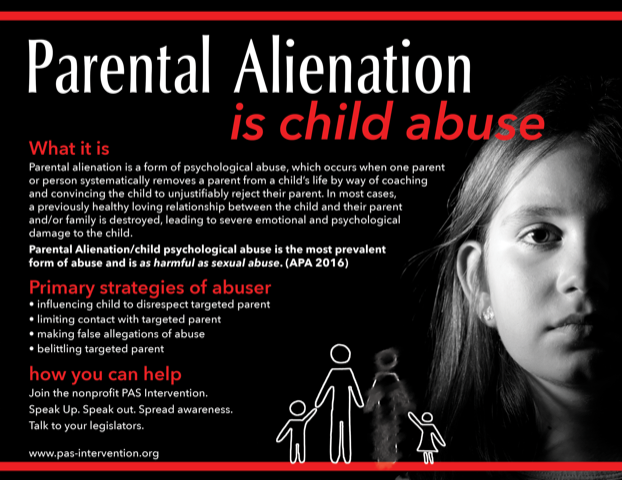 Your voice will help to get the term PARENTAL ALIENATION ACCEPTED IN THE ICD-11. PLEASE CLICK HERE FOR MORE INFORMATION. PARENTAL ALIENATION STUDY GR0UP (PASG) CONFERENCE FOR PROFESSIONALS AND PARENTS. You can attend live for 1-3 days or virtually! Please reach out to Cindy at clhcindy@aol.com to find out about any upcoming conference calls and so you can let her know you would like to participate. DON'T FORGET TO CHECK OUT OUR EXTENSIVE BOOK REFERRALS. Mandy Mathewson and her group are doing several research projects. ADA RIGHTS IN FAMILY COURT ACCORDING TO THE BAR. CLICK HERE! I am on the board of Simply Parent. We are looking for more volunteers to help with our mission to do numerous things with outing and exposing and solving for alienation. Please follow the link to sign up for one of the board positions via the application process. 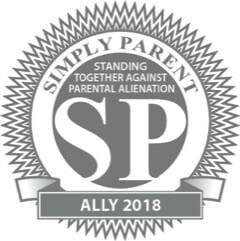 "Simply Parent is a non-profit that is dedicated to forging a society free of parental alienation, where good parenting is protected in its diverse genesis, forms, and colors." One of our members developed a new poster/flyer that we can use. Click to Download a printable White Background version. BECOME A MEMBER and FIND OUT WHAT THAT MEMBERSHIP INCLUDES for only $25 Annually. Access to the Majority of the site requires membership. Can be cancelled at any time! PAS Intervention survives by donations only. Please consider a donation or paying for a membership. Our Tools and Support Really work:This is an awesome case precedent. This is from one of our clients that we helped and who used our tools and advise. I do not know which specifically helped the most, but he emailed thanking us and providing a link to a law review article on his Appellate Case win for custody. Divorce Corp has just learned about a case dealing with child custody rights.We received the information below about a prominent San Francisco attorney who is looking for examples of parents who fought for custody pro se and lost. If you are interested in having your case be included as an example, please read on to find out how to get involved. A prominent San Francisco attorney who is an advocate for pro per parent rights is writing an appellate court motion in the Susan Ferris case and wants to include other examples of parents without an attorney who lost some or all of their child custody rights in court. If you lost full or partial custody at a court hearing where you DID NOT have a lawyer, please contact attorney James Brosnahan IMMEDIATELY by phone or email. If you want to participate in this important appellate case, you need to contact him ASAP. If you don’t meet this criteria, please do not contact the attorney. James Brosnahan: 415-268-7000 Ask for James Brosnahan’s office. Copyright © 2016 Divorce Corp LLC, All rights reserved. CLICK THE LINKS BELOW FOR MORE INFO!! * FREE Podcasts with DANA LAQUIDARA! CLICK HERE!!!! * STOP! Before you send that next TEXT . . . Read this! Just some of the EXPERTS WE SUPPORT! For over 20 years we have been providing free services and support. Please consider a membership subscription, donation or even purchasing one of our fundraiser products. ​disrespect, ignore the laws, overpower and violate ​the rights of the people. PAS Intervention is a federally tax-exempt non-profit under section 501(c)(3) of the IRS. Please note that some or part of stories may be used for educational purposed with the obvious changing of identifying information.